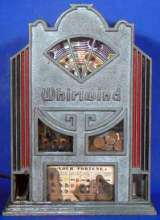 Coin-op Trade Stimulator published 86 years ago by Pierce Tool & Mfg. Whirlwind [Spinning Disc model] © 1933 Pierce Tool & Mfg. Also released as "Whirlwind [Reel model]".